It’s an amazing film. Shot in 1939, the U.S. was still reeling from the great depression, and aware of an escalating war raging in Europe. It was the most expensive production that MGM had ever undertaken, at $2+ million dollars (almost $34 million today). They were betting that this adaptation of a children’s book into a fantasy sequence using new Technicolor would draw audiences in to be distracted from the hardships of life and entertained. A brief escape, a chance to be amazed, to be enchanted with characters they could love. You’re probably aware of the plot. Dorothy, our Kansas farm girl only wanted one thing during the whole movie. After being swept up in a tornado she finds herself in Oz, a fantastical land where she immediately inherits a pair of rube red slippers. But she was scared and spent the whole movie trying to go home. She was looking for someone to tell her how to go home. Many fantastical twists and turns take place. She must avoid and eventually confront the Wicked Witch of the West who’s bent on revenge and brings an entire squadron of flying monkeys. It is only at the very end of the movie that she learns that she had the power to go home all along. 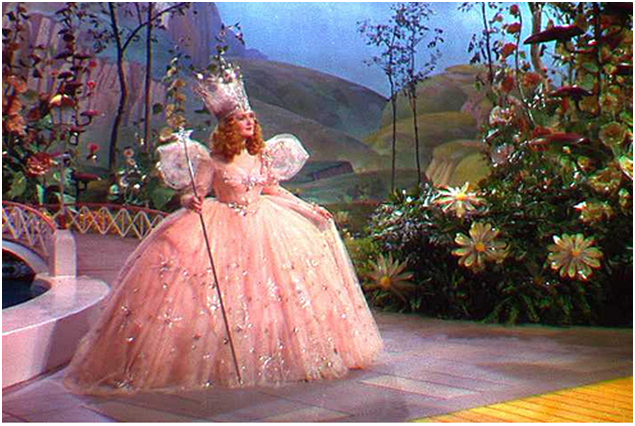 Glenda, the good witch of the North tells her she was always just a heel-click away from taking herself home. After all that work, all that hardship, she could have had it easy. There’s no reason to work hard so hard. As men we’re taught we must WORK HARD and FIGURE IT ALL OUT ALONE. How often are you so hell-bent on doing something the “right” way (YOUR way) that you ignore the easy way. I’m your Glenda. Like my dress? I’m here to tell you, you DON’T have to work so hard! Unless you crave that kind of thing. Some folks love a good process, toiling a spreadsheet or tool to perfection, sweating over the most minute details. Often to no avail where no one but you will appreciate. I am NOT afraid of hard work. I’ve done plenty of it. However, I’d rather work easy than hard. There will be plenty of time for hard work, but everything does not need to be hard, and it’s totally unsustainable. I’m inviting you to spend this week looking for the “heel-clicking-to-take-me-home-easy” way. You aren’t the first nor the last to do what you are doing. And you DO NOT have to do it alone. OR make it up. Lean on the people in your world. Use the Great Oracle (Google). Your friends, co-workers, the people in your work and social groups have infinite experience of their own and are super interested in sharing their insight. Let the week be easy. You deserve it. Use all that extra time and energy to connect with a friend, have a quiet latte mid-morning, take an afternoon walk. Don’t ask anyone’s permission, give yourself permission to do it. Click those heels. Click those heels! Interesting thing about those shoes… one pair was stolen in 2005. They recently were recovered in Fargo, ND. They are still trying to figure out who took them and why…. Who could resist ruby red slippers!?! ?